Ohm Force has just release Ohmicide : Melohman. Based on Predatohm design, Ohmicide:Melohman is organized around up to four frequency bands, each of them coming with their own Noise Gate, Dynamics, Distortion, Feedback Generator and all mixing abilities with just a twist of pre- and post-processing (distortion input, high shelf output). - Phase corrected multiband stereo effect. - Band distortion : a heap of modern sounding stereo distortions that can feedback. - Band stereo : optionally process in mid/side mode for more stereo field tweak-ability. - First Melohman effect: midi controlled preset morphing or randomization. - Great on guitar, bass, synth, and any living creature in general. 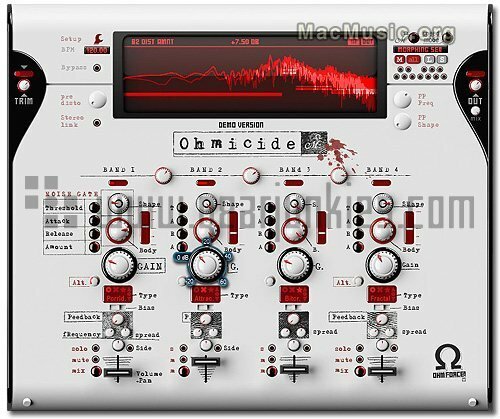 Ohmicide : Melohman is available now for Mac OS X (UB) in VST, AU and RTAS formats. Shipping is exclusively via download on Ohm Force 's web site. There are two license options: Single License version for €79 (includes a single platform only but the customer gets to choose it) and Pack version for €99 (includes all platforms... even future ones). Note that a demo version and audio examples are available. Important Note : if you have a PPC Mac Ohmforce strongly entice you to wait a few more days as last cohmpilation gave birth to a rather unpleasant easter egg. Installers do not work for the moment so you will have to wait a bit.